Footwear is a vital accessory in the wedding ensemble for gentlemen. Indian bridal gents’ footwear are carefully chosen to reflect the cultural influences of the Indian heritage. In this regard, a mojari is an excellent choice. It is a pair of leather slip-on shoes that hail from Rajasthan in India. Mojaris were originally worn by royalty. Normally made from camel leather, these ethnic slippers have padded insoles and are the favored footwear to go with traditional Indian gents’ attire. Mojaris are handcrafted items and come in a variety of designs and colors. 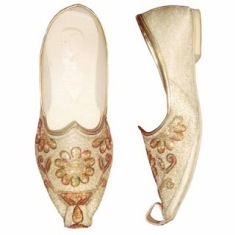 The footwear is heavily embroidered and ornamented. Due to the level of handiwork that goes into creating a mojari, only the upper echelons of Rajasthani society, including the Maharaja, wore them. Once adorned with pearls, gems and precious stones, nowadays mojaris are crafted with beads and bells. Enchanting and delightful to behold, gents footwear reach the epitome of class with leather mojaris. Indian bridal gents’ footwear included the Punjabi jutti, which is also a pair of slippers like the Rajasthani mojari. This footwear is pointed at the top and is made from very soft leather. Gold and silver thread embroidery is prominent on the jutti and can be purchased in very attractive designs and patterns. Heart shaped jutti or patterns with holes are favorites among Indian bridegrooms. The sharp point at the top of the jutti affords the wearer a regal countenance. Indian bridal gents’ footwear have become more trendy and fashionable in present times. Where the groom wears a Western inspired suit rather than a traditional outfit, his footwear would match his chosen attire. In this respect, modern European gents’ shoes are selected to complement the groom’s wedding suit. Black leather shoes which are highly polished to gleam with his suit trousers are the favored pair followed by cream shoes to match light colored suits. If the groom wears a white suit, then his lace-up shoes will also be in white leather. Indian bridal gents’ footwear have evolved from strikingly regal and highly embroidered mojaris and juttis to modern lace-up leather shoes. Gents footwear should be selected to match the groom’s wedding attire.